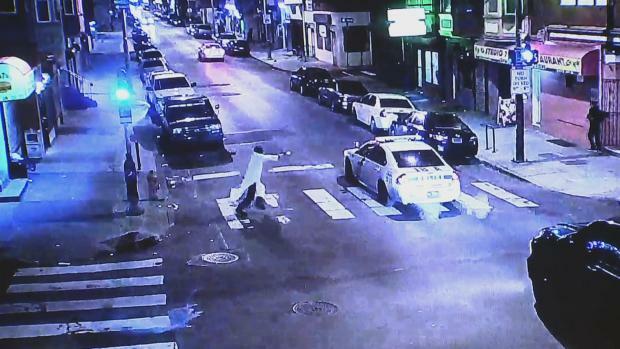 Philadelphia Police Officer Jesse Hartnett was shot three times Thursday night after police said Edward Archer ambushed him in a barrage of gunfire along a West Philadelphia street. Court and police documents show that a Philadelphia police officer whose gun was used to shoot a fellow officer had told investigators it disappeared from his home after he had fallen asleep drunk. The Philadelphia Inquirer reported Thursday the gun used to shoot Jesse Hartnett was the city-issued weapon of Officer Leon Pearson, a 26-year department veteran. Police had previously only said that the gun was stolen from a fellow officer's home. Pearson told the newspaper he had no idea it had been used in Hartnett's shooting. He also said nothing else was taken in the theft and that there were no signs of forced entry. Authorities say Hartnett's left arm was shattered in the attack by Edward Archer, a man police say claims to have acted in the name of the Islamic State.